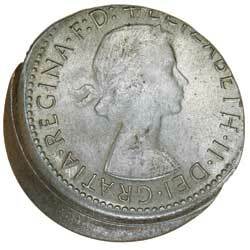 ELIZABETH II, sixpence, 1956, struck off centre by thirty percent and with cupped rim, partly milled. Uncirculated and rare. 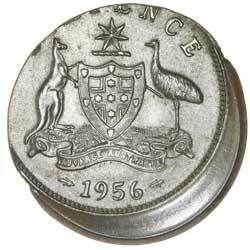 GEORGE VI, halfpenny, 1951, struck twenty percent off centre with horseshoe effect. Very fine.